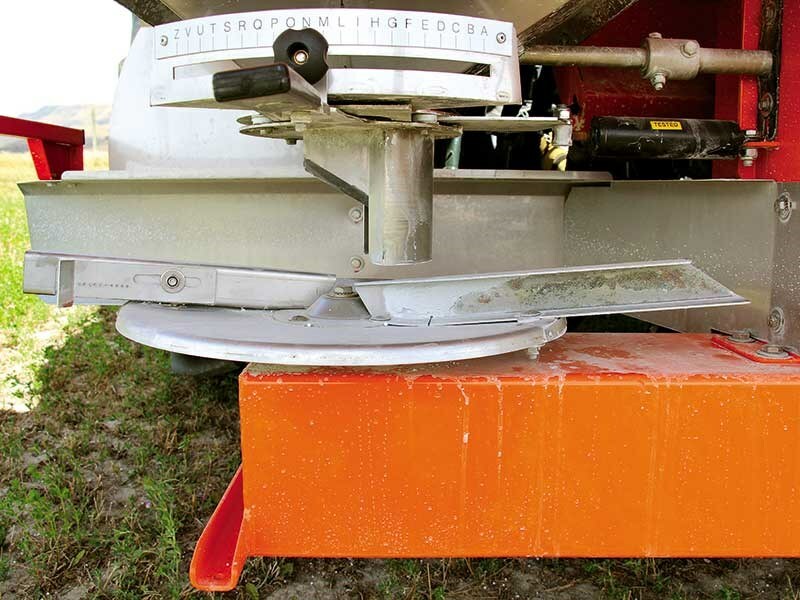 The chart above the disc allows the angle the fert drops onto the spreading veins to be altered. 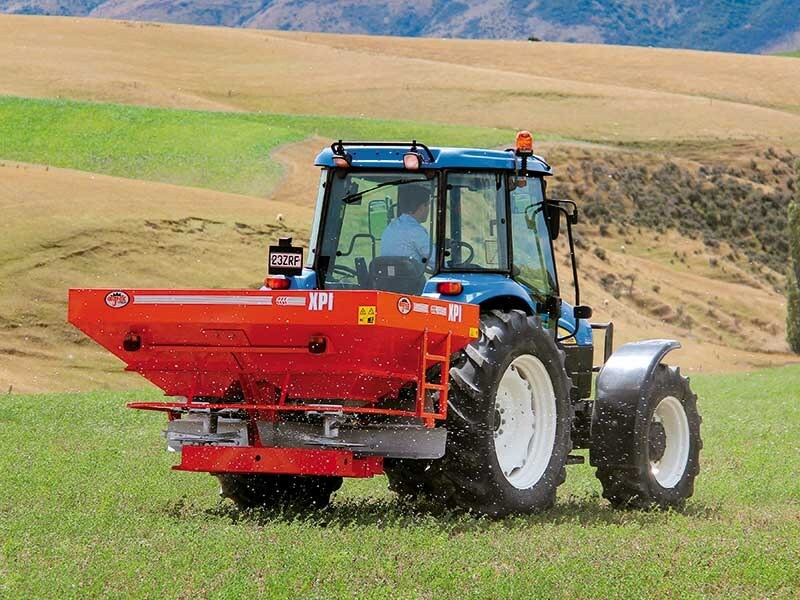 Rata Industries has long been a recognised name for its range of New Zealand manufactured front end loader attachments. 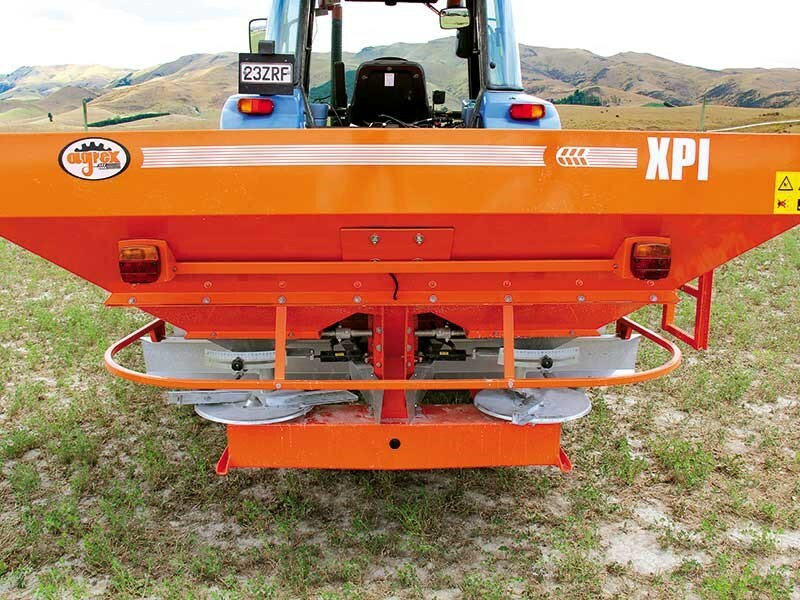 Now its spotted a gap for a high-end spreader in the New Zealand market. This brings me to this month's test at Mawaro Cave, a 250ha finishing property in South Canterbury. I met with Sam Pye and his son Andrew, and although this year was particularly dry for the farm –with an annual rainfall of just 28 inches (or 700mm) – summer rain is always going to be scarce. Sam and Andrew don't have an extensive range of machinery, rather relying on key pieces that either fall into one of two categories – the 'it can make our lives easier' or 'will save us money' category. 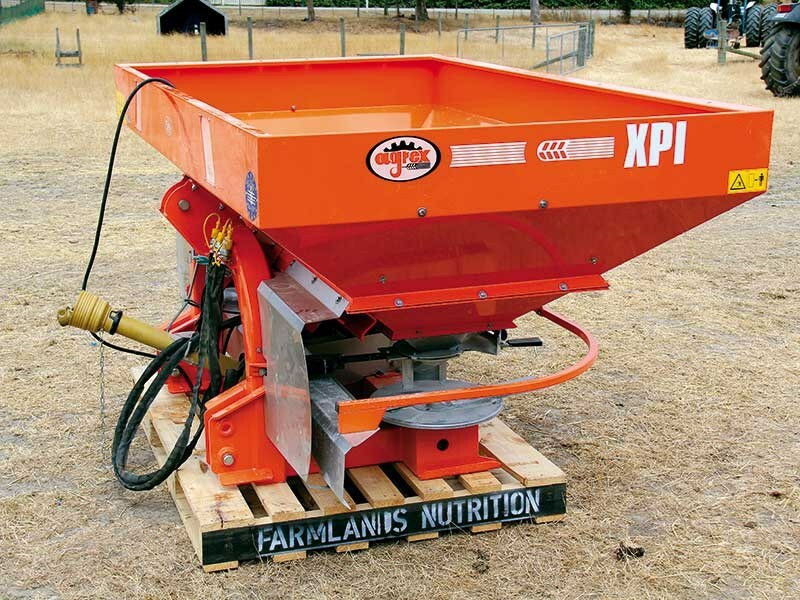 Their new Agrex spreader falls into the latter, as not only will it save them money in terms of eliminating the cost of external contractors doing the work, but it also boasts some nifty features which will help save money from better fertiliser utilisation. 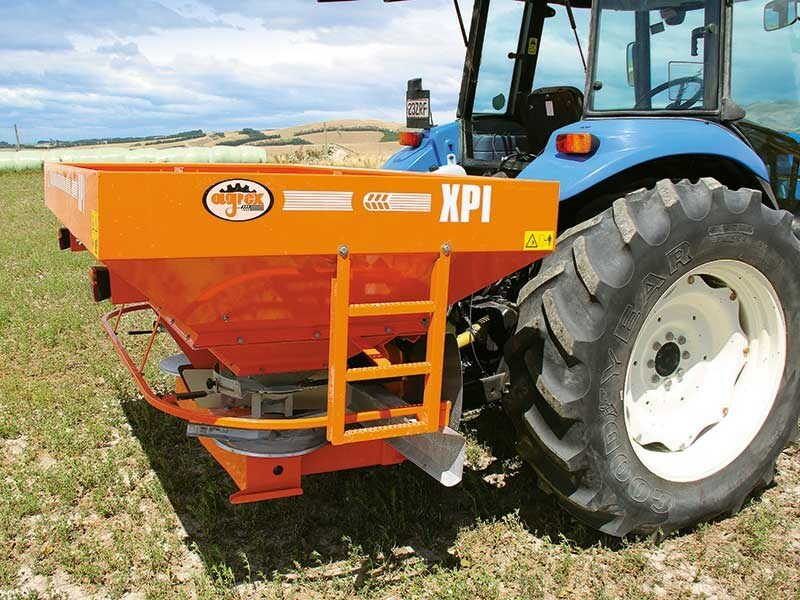 The Agrex XPI fertiliser spreader range has a standard hopper capacity of 1500 litres which equates to roughly one tonne of urea. For relatively little expense however this can be increased to 2000 litres with an extension, or 2500 litres with two extensions, neither of which require any alteration to the standard base. 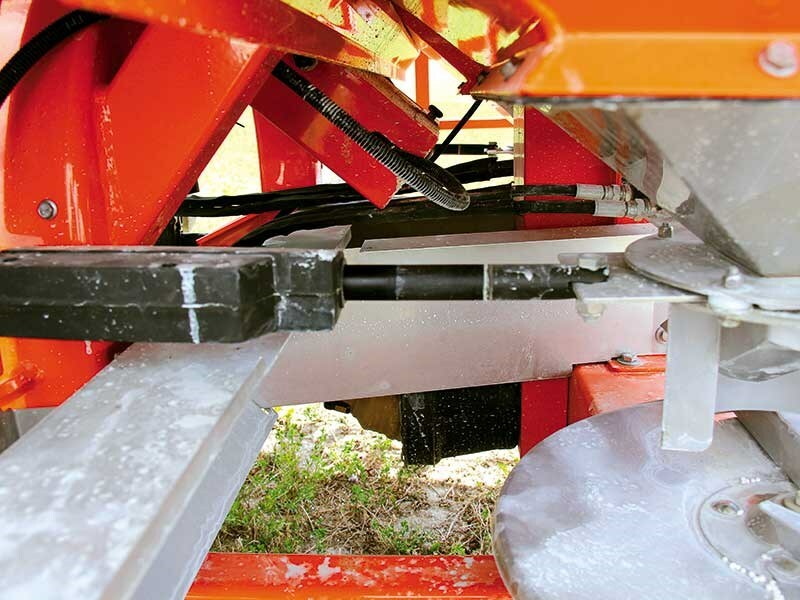 The stainless steel discs make it possible to accurately spread from 12 to 32 metres with a variety of fertiliser types. On the standard machine, opening and closing of the distribution shutters is hydraulically operated with two spools needed. This is also standard on the test machine even though it has the computer controller which actually opens them via an actuator on each side. This is a handy feature. If for whatever reason the computer isn't working, it can still be operated manually and is possible to open both gates or just the right or the left for spreading near around drains, troughs etc. 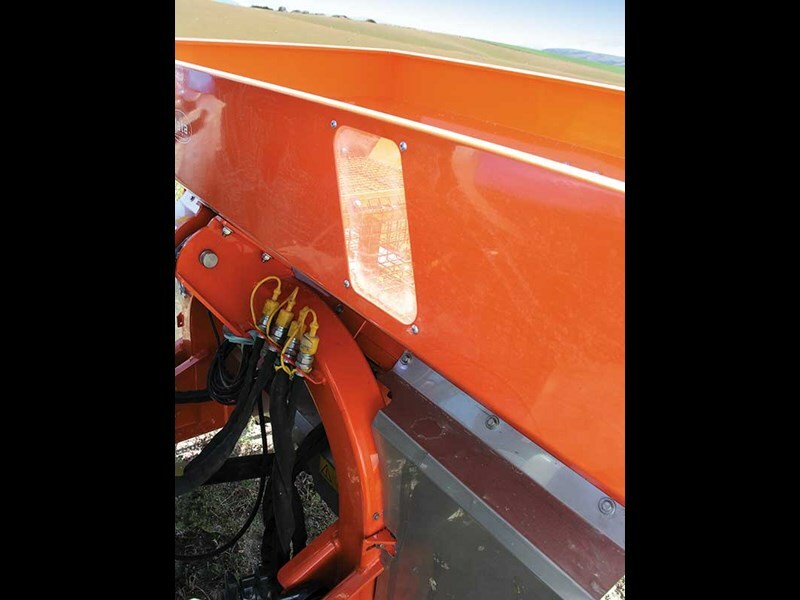 All components in contact with the fertiliser are stainless steel, different levels of stainless steel are available with a full stainless bin an option on the trailing models. 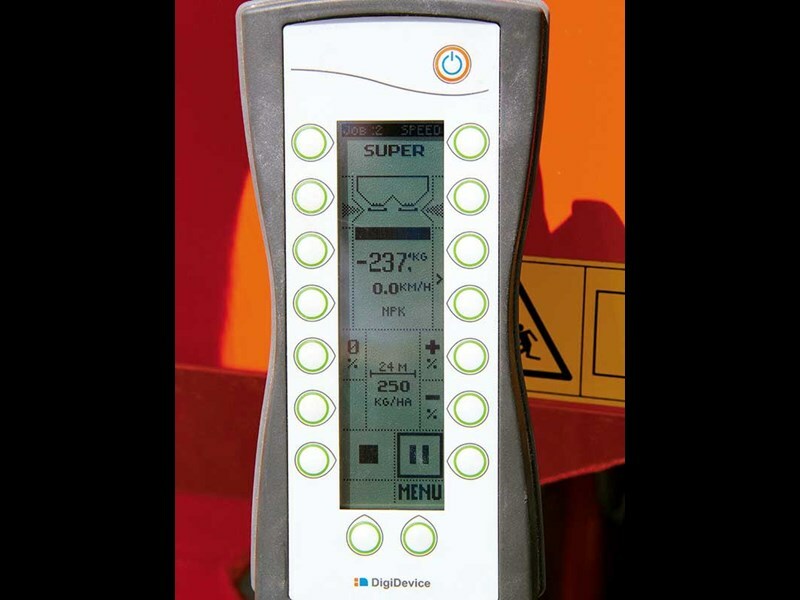 With the electronic rate control on our test machine, this works out the forward speed of the tractor (via a little roof aerial) and if this drops (on a hill or corner for example) the rate of fertiliser coming through the distribution slot is also altered. 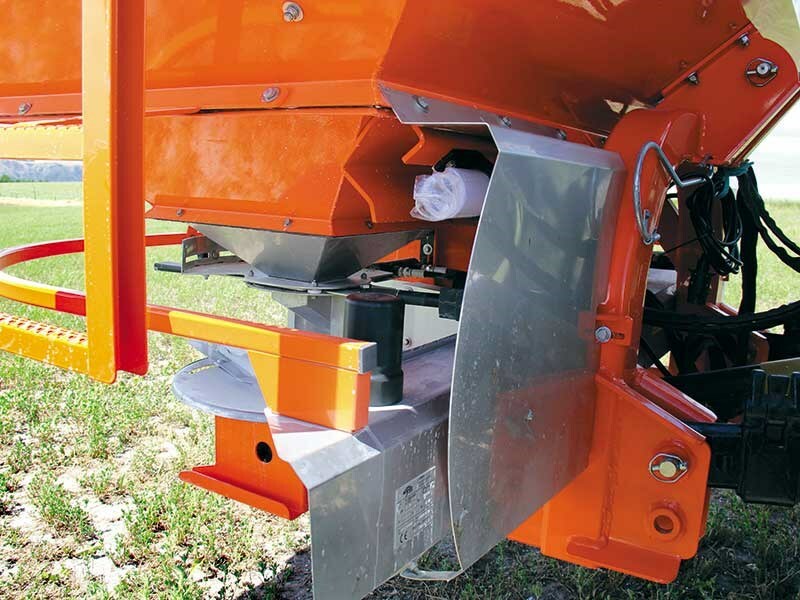 A slow speed (60rpm) horizontal agitator is fitted as standard to each funnel to keep the fertiliser consistently hitting to disc to achieve the uniform spread pattern. The spreading veins on the disc and where the material hits the disc can be altered by hand without any tools. This will vary the spread pattern to achieve the desired spreading width depending on the flight properties of the granules (i.e. 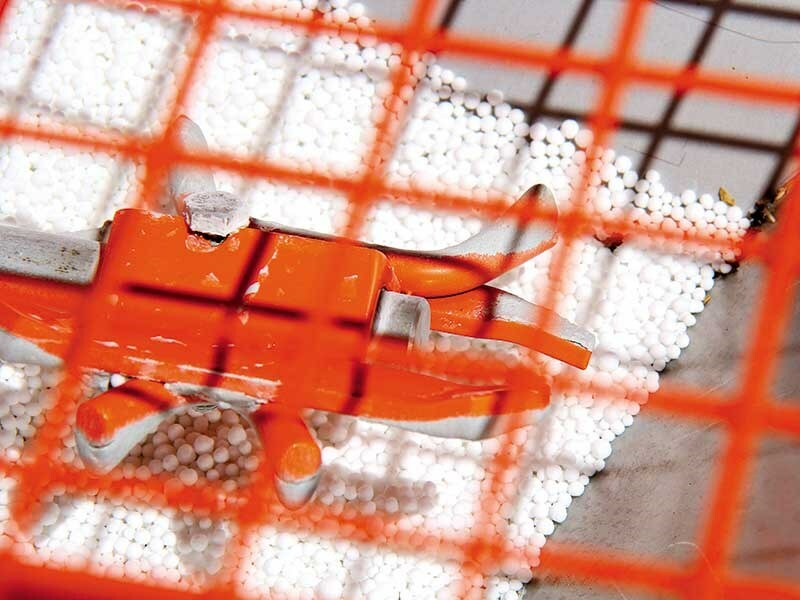 urea vs. DAP will have different flight properties to reach a 24-metre uniform spread). 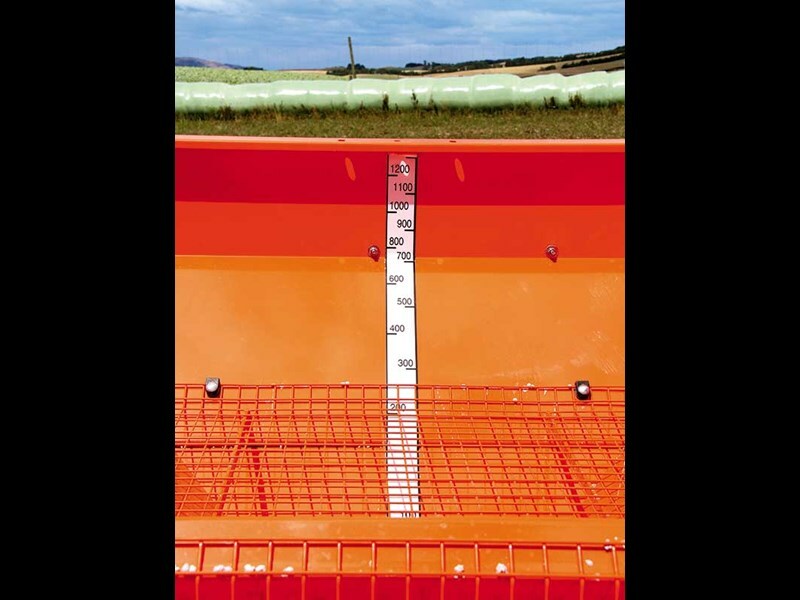 A ladder, road lights, rear wheel (stainless) mud guards and the grates in the hopper are fitted standard to the machines, a water proof roll back cover is an additional accessory. This technology is an additional $4000 + GST over the standard machine. However, like I mentioned earlier, for the Pye family this was a no-brainer as it automatically adjusts the quantity of fertiliser being spread (kg/ha) in correlation to the forward speed of the tractor. 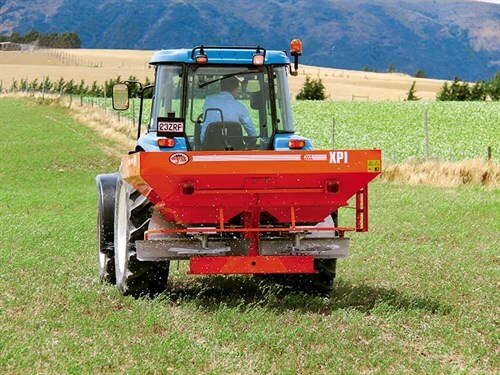 The additional capital outlay will be quickly recouped in fertiliser savings in the first year. Also on the monitor you can store settings to quick memory ie one for super, one for urea etc etc, and the computer will automatically adjust the settings. 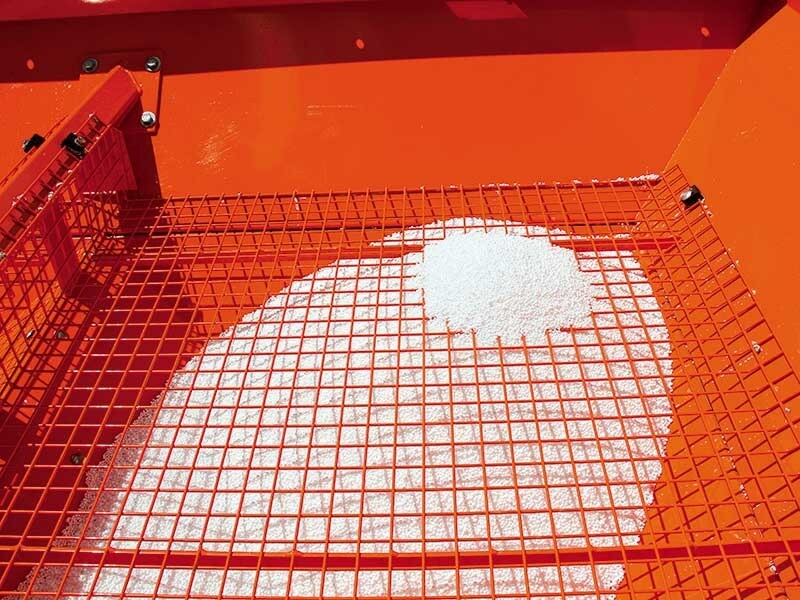 Although the system doesn't have scales, if you know how much you put in – a one-tonne bag of urea for example and the spreading rate of 60kg/ha. The computer then works out the area covered based on the spreading width (in this case 24 metres) times the amount of product through the machine to give you a relatively accurate ha reading (depending on how good your eye is at judging 24m gaps). This system can be set up with GPS and is compatible with most common brands of GPS Trimble, Greenstar, TeeJet etc. 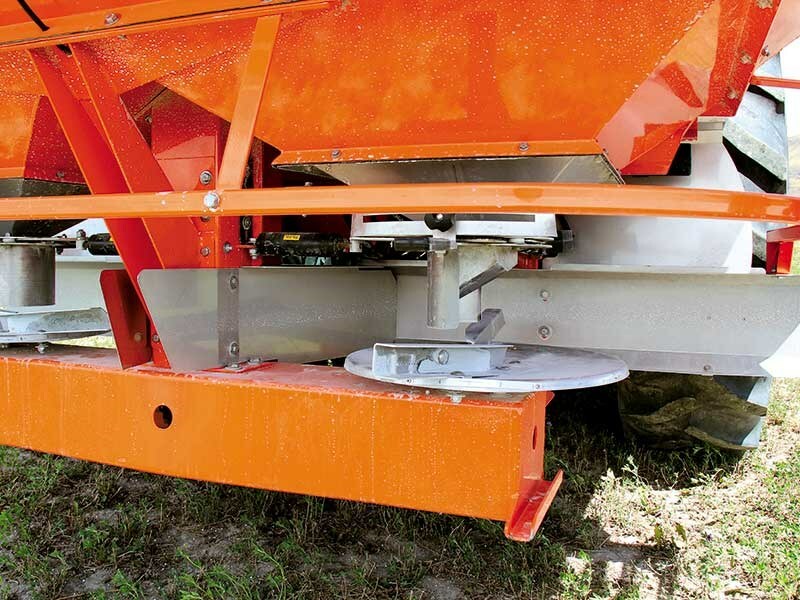 The spreader computer connects directly to the GPS unit to receive speed pulses to give full proof of placement and scales on the slightly large model for those who really want to keep track of the finer details, or those who struggle with the 24-metre gaps. The dry weather this year means the spreader will prove particularly valuable, as when reliable rain is forecast every man and his dog will want fertiliser on. A contractor can only do so much. However, this is no bother to Sam and Andrew. If the weather looks good around 10am, most of the farm could be done by dinner time where you can sit back and watch the rain wash it in. It is hard to put a price on that. For the full review, check out issue #216 of Farm Trader magazine. Subscribe here.